The work of the Synod on Young People continues on Wednesday, with 20 Synod Fathers speaking at the morning's fourth General Congregation. Brother Alois, the Prior of the Taize Community, a special guest of the Synod, also spoke this morning, as did eight of the young auditors taking part in the Assembly. “Today, there are many people who speak about the young, but few who speak to them.” These words of Paul VI were echoed during the fourth general congregation of the Synod of Bishops, which took place Wednesday morning. The theme of listening was an important part of the morning assembly. 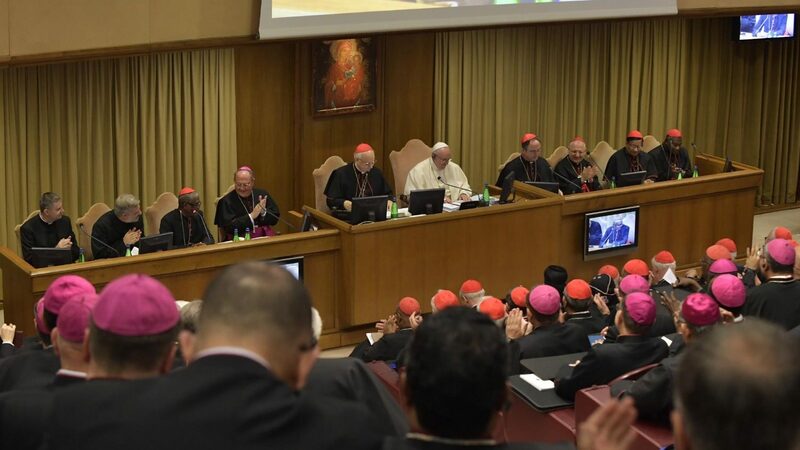 The Synod Fathers heard of the need to listen to young people in the digital world, where an overabundance of information corresponds to a dearth of dreams, with the risk of creating “info-obese” children. But there is also the need to look at the positive face of youth, who are bearers of great human and spiritual resources, such as friendship, solidarity, volunteering, authenticity in witness, the request for coherence addressed to civil society, the call to a more joyful and evangelical Church. Young people, they heard, want to have an adult who will listen to them, dedicate their time to them, welcome them with empathy and respect, accompany them in their discernment—even with regard to their vocation—and not judge them. This need is even greater today, given the attitude of some adults towards young people, which can leave youths disoriented, without a stable point of reference. Speakers on Wednesday morning also talked about the importance of revitalizing the spiritual life of the Church, especially with regard to the Mass, daily prayer, and the Sacraments. These can be a way to attract young people and make them an active part of the life of the Church, encouraging them to play an active role. In liturgical celebrations, then, attention should be paid to a more inspiring use of music, as well as to catechesis and homilies. It is not enough to memorize prayers and formulas, it was said; rather preaching ought to be joyful and inspiring, because young people must understand with their heads, and believe with their hearts. Only in this way can they be the first apostles to their peers. As an agent of change, a builder of peace and unity in the world, youth must be considered a theological place in which the Church recognizes herself. At the same time, Pastors must not limit themselves to waiting for young people in the parishes: the true challenge is to be a Church “going forth,” reaching out to young people wherever they may be. Many young people seem to have many virtual friendships, but few real friends. They suffer a kind of “solitude in abundance,” to which the Church can offer a real response. In the area of formation, the importance of the social doctrine of the Church, a valid compass that can guide young people in their choices was recalled; as was the role of Catholic schools, understood as excellent educational centres, though perhaps not capable of fully incorporating young people into ecclesial life. The call for an alliance between Church and family was another central theme of the day. As the primary educators of children, especially in accompanying the to adulthood, the basic unit of the family, based on Christian matrimony, today must be valued anew. In fact, the family represents in some ways the first seminary for those discerning a vocation. For this reason, it seems necessary to reflect on the figure of the father, a pillar for the transmission of the faith and for the ripening of the identity of children. It is a role, as was pointed out in the Synod hall, that must be appreciated in harmony, not competition, with the role of mothers. There was also an appeal to welcome refugees and migrants, who are often young people and whose dignity is often violated. A key term in this area is solidarity, the prelates noted, so that young refugees might truly feel welcomed and integrated. Speakers also stressed the need to work together so that people might not be forced to emigrate, but able to remain in their countries of origin. Being young today almost seems to guarantee enrolment in the ranks of the discarded: rootless and “nati liquidi” [born into a fluid state]. Young people in our day are uncertain and fragile, often instrumentalised by politics, deprived of a future. On the other hand, they still dream of a world that includes them and allows them to be protagonists of history, creators in the key of service and not of power. The Auditors also appealed for firmness and transparency in the struggle against abuse by people in the Church, so that the Church might become more credible. Finally, they said a greater appreciation of the role of women in ecclesial life was essential, so that women might feel encouraged to grow in the freedom of faith in Jesus.